Font rendering in GTK applications after update to Bionic. 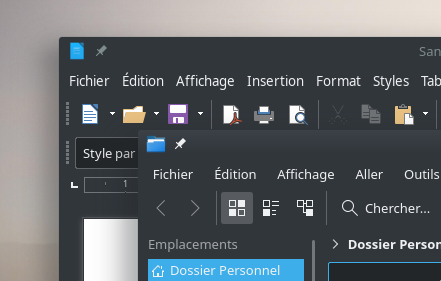 I successfully updated my KDE NEon to Bionic, and I notice that menus' fonts in GTK apps look slightly different from Qt apps, although they're set identically. Fonts are a bit of a pain in KDE. I always find to get them all the same, the Fonts need to be set identically using the qt4-qtconfig & qt5ct packages, then in system settings make sure the GTK fonts match the system fonts. Then repeat the steps using systemsettings5 as root. If that fails try deleting the fonts cache in your home folder. I can't be more specific at present as I'm away from my Neon install. The problem seems to be related to Noto Sans fonts. If I try another font, everything is OK.
Bionic User Edition updated to the latest. Stock settings. I cannot confirm the issue. Please post an image so we can see the faulty font rendering. Hi. Firefox uses Noto Sans against my preferences. Is this same problem? I have installed the package "fonts-liberation2". fontconfig seems to be taking it as Arial by terminal. However Firefox does not use it. Also I tried with "fonts-ipafont" (that is a Japanese font set) and visited some Japanese pages. Noto Sans seems to be prioritized on this case, too. I installed KDE neon after it's rebased on Bionic, but have updated 2 or 3 times. I'm not sure if it's the right way, but I created a new config file at ~/.config/fontconfig/conf.d (name it whatever), https://gist.github.com/BobbyWibowo/37d ... deed9c8afd, to basically set preferred fonts for all 3 of the basic font families. Previously doing fc-match sans-serif would indeed print out Noto Sans, but now it prints out my preferred font and Firefox been using it just fine ever since (make sure you restore fonts to Default in about:preferences). EDIT: From what I know, KDE neon will set Noto Sans, and a bunch of other fallback fonts, as the default preferred fonts for sans-serif (as well as other Noto's for the other families) at /etc/fonts/conf.d/56-neon-noto.conf. User configs however, are being loaded at order 50 (so yeah, before 56), so the previous config I linked would take precedence. EDIT 2: Also check out the font being used in ~/.gtkrc-2.0, however this should automatically be generated by System Settings > Application Style > GNOME Application Style (GTK). bobbywibowo, thanks for your replying and gist. (1) The font settings of its about:preferences is ignored. (2) It cannot load any local fonts except default fonts that assigned to one of "serif", "sans-serif", or "monospace". # "fantasy" and "cursive" are not loaded. # Web fonts are always loaded. Adding <prefer> tags into ~/.config/fontconfig/conf.d resolves (1). Adding @font-face for the not-loaded local fonts into userContent.css resolves (2). Perhaps, both are not solutions to the root of the problems. about:preferences has been ignored still. Well, although, my fonts can be displayed now for the present. Additionally, ~/.gtkrc-2.0 and ~/.config/gtk-3.0/settings.ini seems to be ineffective for web contents of Firefox. ytomino wrote: (2) It cannot load any local fonts except default fonts that assigned to one of "serif", "sans-serif", or "monospace". I guess I shouldn't be surprised, but this was also caused by neon's 56-neon-noto.conf. UPDATE: Today's updates have fixed this (reference: viewtopic.php?f=309&t=155233#p405721). bobbywibowo wrote: UPDATE: Today's updates have fixed this (reference: viewtopic.php?f=309&t=155233#p405721). Oh, about:preferences works now. Thanks! I think fontconfig is not a cause of nybac's problem. 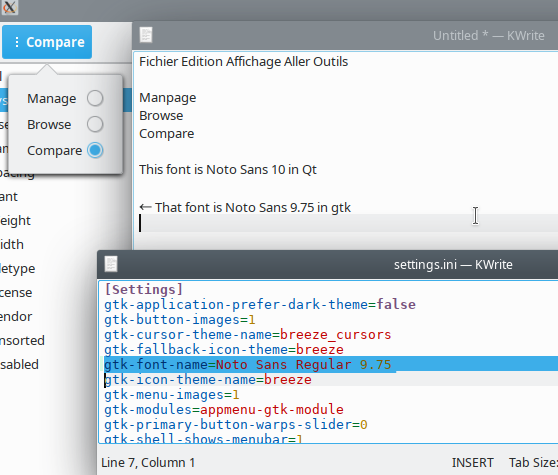 Surely the gtk menu font seems to be higher than qt slightly, but they look same roughly. Perhaps the rounding is a cause, because 10pt equals to 13.33...px and it would be rounded up to 14 in gtk, but rounded down to 13 in Qt. So I edited ~/.gtkrc-2.0 and ~/.config/gtk-3.0/settings.ini with the editor. The changing of ~/.config/gtk-3.0/settings.ini is reflected. Thanks a lot, this looks very much better. Do you have a clue to do the same for root GTK applications such as Synaptic ?